The TEL-06 survey data probably represent the most challenging EM data set of the surveys conducted. They are used as an example of the procedures employed. The eastern-most area of NI contains the majority of the population and zones of infrastructure with extensive power-distribution routes. 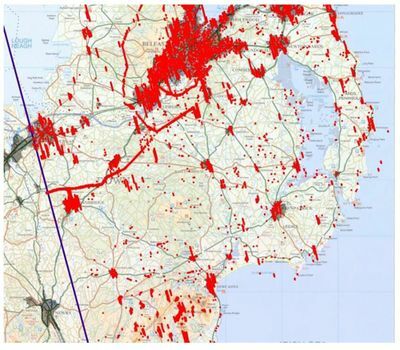 All the conurbations required high-fly conditions and the area of greater Belfast was surveyed at high elevation as a continuous and large zone. The survey also includes a large coastal zone in which transitions from low geological conductivities (e.g. <~50 ms/m) to seawater conductivities in excess of 1000 mS/m are observed. It should be appreciated that the modelling analysis conducted here implicitly assumes a 1D conductivity structure. The TEL-06 EM survey data contain 2 355 137 data points (P, Q, ALT) at 4 frequencies. Here we consider only the LF (3 kHz) and HF (12 kHz) data. The inversion of the LF data produced an L1 misfit at the >25% and >100% error level as shown by the distributions in Figure 4a, b respectively. Some 517296 data points (22% of total) have an error of >25%. Some 90 072 data points (4% of total) have an error >100%. In the case of the higher frequency data (12 kHz), the equivalent results shown in Figure 4a, b provide 595 475 data points (25% of total) with an error of >25% and some 147 672 data points (6% of total) have an error >100%. From Figures 4 and 5 it is evident that the higher misfits would provide a basis for culling (rejecting) invalid conductivity estimates, thus increasing the validity of the information provided. The survey zone across Lough Neagh is noticeably free of enhanced errors due to the lack of EM noise sources and relatively uniform low altitude flying. The misfits show an obvious association with towns/conurbations and areas of high-fly. The misfits >100% identify the major cross-country power distribution grid that link to the Larne power station on the east coast. In addition there are isolated zones and individual points across the survey area that provide invalid estimates. Figure 4 L1 misfit errors for the TEL-06 LF data. Blue areas denote urban zones. (a) Errors>25%. (b) Errors >100%. Figure 5 L1 misfit errors for the TEL-06 HF data. Blue areas denote urban zones. (a) Errors>25%. (b) Errors >100%. 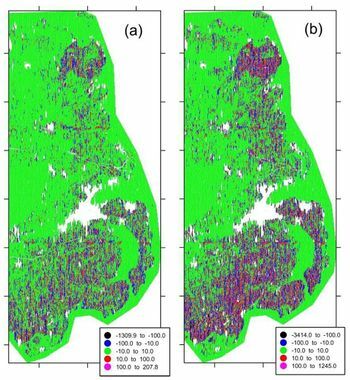 A more detailed view of the spatial distribution of misfits >100%, at 3 kHz is shown in Figure 6. The association between conurbations and the presumed reduction in signal/noise due to high-fly (discussed below) produces zonations in the behaviour of the misfits (e.g. the Belfast conurbation). Setting these areas aside, there remain points and ‘line-bursts’ of enhanced misfit that can be identified and thus culled from the model data set. The line bursts include those associated with the power distribution grid. 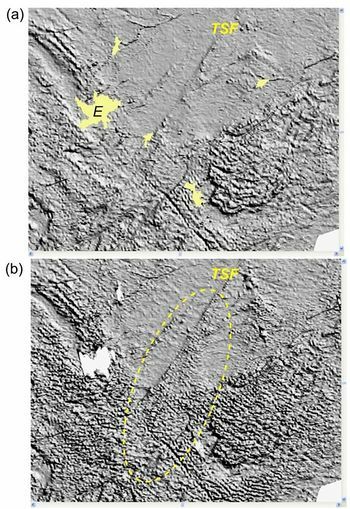 These points and bursts, when omitted, can be resampled by interpolation procedures to provide a more reliable spatial data set for geological and environmental assessment. Figure 6 Detailed view of the L1 misfit errors >100% for the TEL-06 LF data. Figure 7 shows a 1 x 1 km square representing the location of the Ballymacvea landfill discussed by Beamish and Young (2009). To the south of this area, an E–W cross-country powerline produces misfits shown by the along-line black symbols. The coloured symbols denote the existing 3 kHz apparent conductivity shown in a 5-band colour and proportional size scheme. The highest conductivities (>80 mS/m) are shown in red. The misfits >100% across the area only occur in association with the powerline but it can be noted that not all powerline locations produce high misfits. The procedure of data culling will therefore not be 100% effective since it will depend on the misfit level chosen. The choice of error threshold is a necessary compromise when developing an appropriate signal/noise culling procedure for these data. Figure 7 Detailed view centered on 1 x 1 km square (in red) of the area of the Ballymacvea landfill. Existing LF apparent conductivity shown in a 5-band colour and proportional size scheme. The highest conductivities (>80 mS/m) are shown in red. Black symbols denote the L1 misfit >100% zones and partially track a power-line route. 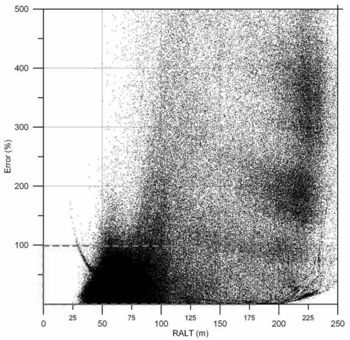 The radar altimeter data (RALT) for the total TEL-06 data set ranges from 22 to 299 m with a mean of 68 m and a median of 59 m. The behaviour of the misfit error (restricted to <500%) and RALT at 3 kHz is shown in Figure 8. The behaviour observed at 12 kHz is very similar. The behaviour is complex but it is evident that the majority of low misfits (e.g. <10%) are associated with the nominal height flying (~56 m). It is also apparent that misfits <100% are largely associated with the condition RALT <100 m. The behaviour of the misfit errors along the line of RALT=120 m is connected with a reduction in the number of iterations applied to stabilise the inversion for high-fly data. Figure 8 Variation of L1 misfit error (clipped to 500%) and radar altitude (RALT) for the TEL-06 LF data set. Figure 9 shows the behaviour of the misfit error (restricted to <500%) and RALT at 12 kHz using a linear error scaling. The rectangle in red defines an upper misfit limit of 100% and shows the points in the misfit cloud that would be excluded using this threshold value. In order to accommodate a further exclusion of high-fly misfit errors, the rectangle also indicates an upper threshold of 180 m (about 3 x nominal) that would further exclude a set of misfits with values <100%. This restriction is applied to accommodate the inconsistent behaviour of the apparent conductivity values returned across high-fly zones. The actual threshold is arbitrary but has been arrived at following studies on the delivered data sets. 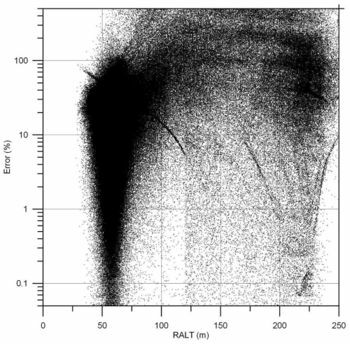 Figure 9 Variation of L1 misfit error (clipped to 500%) and radar altitude (RALT) for the TEL-06 HF data set. The transform and inversion procedures are applied to (P, Q, ALT) data. The application of minimum threshold values to P, Q data sets in the case of transform procedures are described in Appendix 1. In the reprocessing/inversion of the data considered here a minimum value threshold of P, Q = 20 ppm (LF data) and P, Q = 30 ppm (HF data) has been applied. Thus if either of the P or Q values are less than the threshold value then both P and Q are set to the threshold value. This low value thresholding procedure provides limiting values in the estimates of apparent resistivity/conductivity in both transform and inversion modelling. 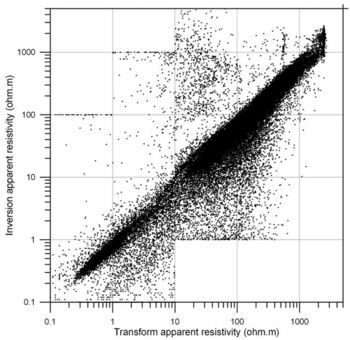 The transform and inversion procedures provide identical/similar estimates of apparent resistivity/conductivity when using good quality data. When complex data sets containing various noise sources are considered, significant variations become apparent. Figure 10 compares the contractor delivered apparent resistivities with those from the inversion procedure at 3 kHz for the TEL-06 data. The contractor delivered transform apparent resistivities range from 0.01 to 2749 ohm.m (see Appendix 1) and the inversion apparent resistivities range from 0.1 to 10000 ohm.m. In the latter case, lower and upper values are threshold (clip) limits applied to the results of the inversion. In Figure 10 a strong linear behaviour is observed between the two sets of estimates with a tendency for the transform value to be less than that of the inversion value. This is most apparent towards higher values of apparent resistivity. Limiting values are observed in relation to the behaviour of low amplitude (P, Q) threshold used in the 2 procedures. Figure 10 Plot of transform and inversion apparent resistivity estimates for the TEL-06 LF data. Inverted model apparent conductivities obtained for the TEL-06 LF data using the ERR (100%) and RALT (180 m) culled data set are shown for the area around Belfast in Figure 11. 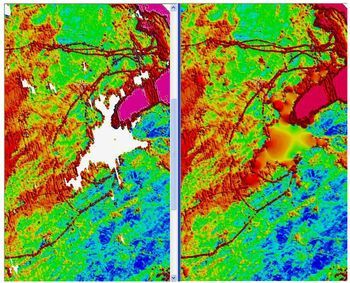 Both images use an equal-area colour scale and a maximum conductivity threshold of 1000 mS/m. The image on the left is minimum-curvature (MC) grid with a cell size of 50 m. The image on the right is a natural-neighbour (NN), or ‘tinned’ grid with a cell size of 50 m. The MC grid provides min/max data values of -192/ 1177 mS/m. The NN grid provides values of 0.4/1000 mS/m and is faithful to the observed data values. The MC gridding procedure was originally intended for potential fields. Undershoot and overshoot occur in the MC grid across all sharp boundaries in the conductivity distribution. 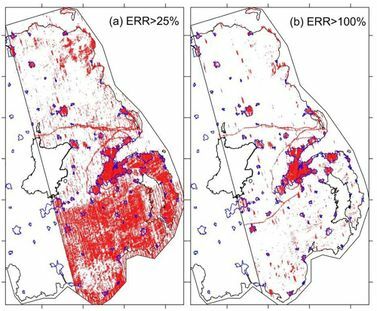 Undershoot and overshot bleeds are most evident across power lines and at the coast but they exist at smaller scales and such edges form targets for both geological and environmental interpretation. It is concluded that the NN gridding technique is the most suitable method for gridding the EM and conductivity/resistivity data sets. Figure 11 Inversion result grids (detailed area) from the TEL-06 LF data. Both images use 50 m cells and equal-area colour. (a) Minimum-curvature grid. (b) Natural-neighbour grid. It should be noted that corrugations exist in the model and cannot be removed by either of the gridding techniques. The MC grid, as implemented in the Geosoft procedure, allows for a blanking distance and the left image contains ‘no data’ blanks across the culled portions of the data. When ‘no data’ blanks exist at scales less than the grid cell size, non-null values are returned in the grid. Elsewhere large values of culled data are defined as blank. It can be noted that high conductivities are still associated with the power line routes. This is because although the central region of the perturbation is identified at an error level of 100% (e.g. Figure 7), perturbation, ‘side-lobes’ still exist and form part of the data set that is gridded. A natural consequence of the NN gridding procedure is that ‘no data’ blanks are filled with interpolated values. When no-data zones exist at small scales, the interpolation is advantageous. With increasing size and complexity of no data areas, the interpolation may become exotic and inappropriate. The inversion of the P, Q, ALT data to provide best-fitting estimates of apparent resistivitity generates a half-space model that may require a further degree of levelling. In the context of magnetic data this is referred to as microlevelling but with spatially focussed resistivity estimates the method of choice is the floating median difference (FMD) method described by Hautaniemi et al. (2005) and further by Mauring and Kihle (2006). The method is based on a sliding window technique and is a statistical adjustment of the data both along each flight line and across sets of adjacent flight lines. The non-linear median filter acts as a noise filter and removes any localised spikes and although it is a smoothing filter it preserves edges in the data set. In the implementation used here, the level of the correction is controlled by a linear variable so that lower values of apparent resistivity (with greater accuracy) are not corrected as heavily as high values. The procedure used is also designed to suppress the generation of negative values. In order to apply ‘light’ levelling data adjustments, a scheme based on a window length of 1000 m along each line and a 500 m length/radius across lines (i.e. using 2 lines adjacent to each central line, a total of 5 lines) is adopted. It should be noted that that the levelling is best performed on accurate data. 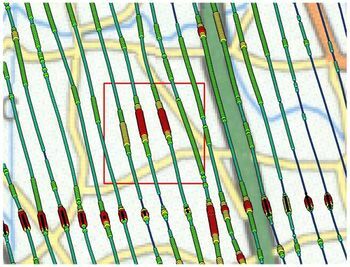 The FMD procedure is therefore applied here to the culled data sets (ERR<100% and RALT<180 m) and so the rejected (poor quality) estimates of the apparent resistivity are not included in the statistical calculations. In practice the procedure works in a true distance reference frame about each point. The survey data are all flown at a nominal orientation of 345° so that the data are rotated to N–S to apply the FMD procedure and then subsequently rotated back to 345°. The FMD levelling corrections applied to TEL-06 inverted apparent resistivities (culled data) are shown in Figure 12a in the rotated (N–S) reference frame. The images are posted colour values using a 5-band data value scheme that emphasises the small adjustment central region (-10 to +10 ohm.m) together with outlier values. The culled data set at 3 kHz (Figure 12a) has 2 210 512 data points and the 12 kHz data set (Figure 12b) has 2 193 131 data points. The HF data can be seen to have higher levels of adjustment than the lower frequency data. In both cases the large majority of data is adjusted only slightly. In Figure 12b, 68.2% of the data occupy the interval from -10 to +10 ohm.m with only 2.3% in the outer 2 tails (adjustments >100 ohm.m). Figure 12 Posted value plots of the FMD levelling corrections applied to the apparent resistivity model estimates for the TEL-06 data. Rotated (N–S) reference frame. (a) LF data. (b) HF data. The results of applying the levelling are shown, as previously, for the area around Belfast in Figure 13. It is evident that the levelling applied has resulted in an effective decorrugation of the original data set. Figure 13 Detailed area inversion result grids (NN) from the TEL-06 LF data. Both images use 50 m cells and equal-area colour. (a) Pre-levelled data. (b) FMD levelled data. Resolution comparisons are better demonstrated using shaded-relief images. 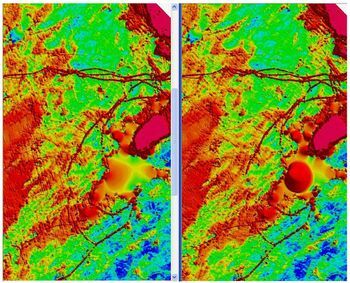 Figure 14 shows shaded-relief images of the transform and inversion results of LF apparent conductivity in the SW of the Tellus survey in the vicinity of Enniskillen (‘E’ in Figure 14a). The existing transform data clearly display a lower degree of detailed resolution than the inversion data. Figure 14 Detailed area inversion result grids (NN) from the TEL-06 LF data. Both images use 50 m cells and equal-area colour. (a) Pre-levelled data. (b) FMD levelled data. It could be argued that the lower resolution transform image is preferable since it detects only the largest of the gradients that exist, and that this ‘simplification’ is useful. The higher resolution inversion result image does however detect a possible splay structure associated with the termination of the Tempo-Sixmilecross Fault (TSF). ↑ BEAMISH, D, and YOUNG. M. 2009. 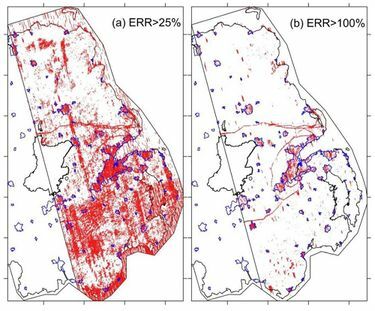 Geophysics of Northern Ireland: the Tellus effect. First Break, 27, 43–49. ↑ HAUTANIEMI, H, KURIMO, M, MULTALA, J, LEVÄNIEMI, H, and VIRONMÄKI, J. 2005. The ‘three in one’ aerogeophysical concept of GTK in 2004. Geological Survey of Finland, Special paper 39, 21–74. ↑ MAURING, E, and KIHLE, O. 2006, Leveling aerogeophysical data using a moving differential median filter: Geophysics, 75, L5–L11.